Star Wars fans across the globe, and literally the entire Internet, rejoiced on Friday when it was officially announced that Donald Glover will be playing Lando Calrissian in the upcoming Han Solo spinoff movie. Glover will star opposite Alden Ehrenreich, and the film is slated for a May 25, 2018 release. The casting is like a dream come true for Glover, who grew up as an avid fan of Star Wars and says it's like the bible to him. Directors Phil Lord and Chris Miller noted that Ehrenreich went on an audition pentathlon for the role, and we wonder if Glover went through a similar ordeal. There’s also rumors circulating that the Han Solo prequel movie will actually become a trilogy. With Ehrenreich and Glover cast, the hunt is on for the leading lady of the tale, with Tessa Thompson and Zoë Kravitz recently completing screen tests. A self-proclaimed galactic entrepreneur, Lando Calrissian is known for his charming personality and suave demeanor. Han might have originally described Lando as a card player, gambler, and scoundrel to Leia, but it’s hard to deny that Lando is an iconic character from the original saga. Originally played by Billy Dee Williams, Calrissian is the embodiment of cool, sporting a cape that’s reminiscent of the Godfather of Soul himself, James Brown. Here are 15 Facts You Never Knew About Lando Calrissian. On July 8, 2015, Lando Volume #1 was released as part of a series of five Marvel comics following Calrissian’s adventures. Created by comic artist Alex Maleev and writer Charles Soule, the series takes place after A New Hope, following the smuggler’s life (without the Falcon) before appearing in Empire Strikes Back. In an attempt to clear his past debt with crime boss Papa Toren, Calrissian takes on one more job to settle the score. Much to Lobot’s dismay, who would rather fight Toren instead, Lando reluctantly agrees and the two end up working together for one final job. They meet up with an Ugnaught named Sava Koren Pers, who has a background in mysterious antiquities and a pair of panther-like clone warriors called Aleksin and Pavol. Lando ends up stealing a luxury yacht called The Imperialis, with the understanding that Toren will let him keep everything on board. He assumes the ship is owned by "some piece of rich Imperial scum" and intends on keeping the rare artwork and valuable collectibles inside. Little does he know that the ship is actually owned by Emperor Palpatine himself. Alerted to the ship's disappearance, the crew narrowly escapes a blockade of Imperial Star Destroyers, and Palpatine sends bounty hunter Chanath Cha to reclaim the ship. Emperor Palpatine warns her that if the mission is a failure, the ship should be destroyed. Lando soon discovers that the ship was not only filled to the brim with artwork and treasures, it even contained powerful Sith artifacts. In the films, Lobot is shown as his assistant, but in the comics we’re given a glimpse at their longstanding friendship, and the two have an interesting dynamic. Lobot acts as his voice of reason, urging Lando to quit his risky lifestyle and eventually try to settle down. This verges into spoiler territory, so skip on to the next item if you’re planning on reading the Lando comics spoiler-free. Towards the end of the series, Lobot eventually sacrifices his entire mind and personality in order to help save Lando. Our hero knows about Lobot’s past relationship with the bounty hunter Chanath Cha, and tries to convince her to stay to help him, but she refuses. In the end, Lobot leaves him a pre-recorded message, urging Lando to use his skills for good. Adding a nice layer of emotional depth for his later actions in the films, Lando makes a vow to cure his friend. Written by L. Neil Smith, Lando Calrissian and the Mindharp of Sharu was the first installment of the series and was released on June 12, 1983. The book kicks off with Lando winning the Millennium Falcon in a game of sabacc, along with a squid-like robot from the planet of Rafa I. The first book was released to a lukewarm reception, with some fans feeling that Lando's depiction was out of character. A month later, Lando Clarissian and the Flamewind of Oseon was published on September 12th, 1983, and the final book in the series, Lando Calrissian and the Starcave of ThonBoka was released on November 12, 1983 through Del Rey. The late Ralph McQuarrie created some concept artwork for the first novel which mysteriously went unused, though some of the would-be cover art was later released online and in the Ralph McQuarrie Star Wars artwork books. Overall, the books had mixed reviews, but they remain a worthwhile read if you're keen on finding out other possible directions that Lando might be headed in the new canon. You never know if Disney might follow up with some of these plot ideas in future work. Although we're first introduced to Lando in Empire Strikes Back at the luxurious Cloud City, which resides over the gaseous planet known as Bespin, he's not a native. According to Ultimate Star Wars, Lando Calrissian was originally from the Outer Rim, and he was born on Socorro, a planet in the Kibilini sector of the Outer Rim. As a side note, in Spanish and Portuguese, the word “socorro” translates as “help” or “relief”. Judging by Lando’s initial actions, it might seem like the only person he’s looking to help is himself, but in the end, he does aid the rebel cause in Return of the Jedi. Although now deemed part of the out-of-continuity Legends (formerly known as the Expanded Universe), a Jedi academy specifically for training potential Jedi Guardians was also located on Socorro. We were given a glimpse at Lando's upbringing in Lego Star Wars: The Yoda Chronicles, Attack of the Jedi and The Phantom Clone, which originally aired in 2013. Billy Dee Williams was brought in to voice Lindo Calrissian, the father of Lando, alongside familiar sounding voices like Anthony Daniels as C-3P0 and Tom Kane, who voiced Yoda in The Clone Wars series. In the series, Lindo Calrissian is shown with a young Lando aboard the Millennium Falcon, which had actually been turned into a traveling nightclub. Who knew? A party on the Millennium Falcon sounds pretty sweet! In season one, episode nine of Star Wars Rebels, Lando made a brief appearance on an episode aptly entitled “Idiot’s Array”. For those who need to get re-oriented with the timeframe, Star Wars Rebels takes place after Revenge of the Sith and before A New Hope. Short on credits, Zeb plays a game of sabacc with a certain smuggler, and ends up unwittingly betting dear old Chopper as part of the deal. Lando ends up winning Chopper, though he later makes a deal with the crew, agreeing to return Chopper if they work for him for a spell. Lando tells them about his situation and convinces the Ghost crew to help him get past an Imperial blockade. After narrowly making it through, the crew was tasked to meet with the crime lord Azmorigan for a trade. Lando pulls a fast one on Azmorigan, offering Hera as a slave, but later escaping with her and some precious cargo. The crew soon discovers that Lando’s actually trying to get a pufferpig past the Imperials, a special creature which helps sniff out mining locations. In the end, Lando returns Chopper to the crew, who sneaks off with some of his fuel before they fly away. In the closing scene, Lando smiles and says that he knew Chopper took the fuel, and that was actually his payment to the rebels. The ending is ambiguous and suggests that it’s possible that we’ll see him again in Star Wars Rebels season three. We’ll just have to wait and see. Han Solo wasn’t the only one to score big with the sabacc card game. Lando Calrissian initially won the Millennium Falcon through a sabacc match with Cix Trouvee. An incessant gambler, Cix felt overwhelmed by the Falcon’s maintenance work and preferred having credits. Although Lando was a novice pilot at the time, he took tips from Solo when it came to flying the freighter. Later, Calrissian hit the sabacc decks again, this time facing off with Han in Cloud City. The book Star Wars Millennium Falcon retells the tale, citing that when Lando found himself depleted of credits, he desperately offered to put “any ship” on the line. Much to his surprise, Han won, chose the Falcon, and the rest is history. At another sabacc tournament, Calrissian took things to the next level when he played against none other than Dominic Raynor, the Baron Administrator of Cloud City himself. After a heated game, Lando walked away with the entire title of Baron Administrator, including all the responsibilities attached to the role. Instead of just cashing in his credits, Lando actually took his role quite seriously. In the Millennium Falcon book, author Ryder Windham writes of our hero's successes as a leader. "He improved living conditions for all citizens, increased profits for the Tibanna gas mining operations, protected the city from pirate raids and did his best to discourage the Empire from having any proprietary interest in Cloud City." In Empire Strikes Back, Lando proudly tells Han that his mine was an independent operation, and it wasn't part of the mining guild, nor was it under the Empire's jurisdiction. Originally, actor Yaphet Kotto, who played Dennis Parker in 1979 Alien, was offered the role, but he turned it down. In an interview with the Austin Chronicle, Kotto rejected the role, saying, “They'll kill me off. I'll have trouble finding work after that." Actually, Lando survives the whole ordeal from Empire Strikes Back and Return of the Jedi, so his worries were for naught. In another interview with IGN, Kotto stated that he just didn’t want to be typecasted and wanted to stay on Earth. Lando first made his on-screen debut in Empire Strikes Back in 1980, a role that was culturally significant because there weren’t very many African Americans portrayed in American science fiction cinema. The Oxford African American Studies Center points out, “His depiction of the charismatic ladies’ man left a lasting impression on fans as the only black character with a speaking role in the original trilogy.” Unlike James Earl Jones, who lent his iconic voice as Darth Vader, Billy Dee Williams was given a visible role where he was shown on screen. Disney has been changing their ways with more diverse casting choices, as The Force Awakens featured John Boyega and Lupita Nyong'o, and upcoming Rogue One is set to star the great Forest Whitaker. It looks like there's more to come with Donald Glover playing a young Lando in 2018. We know that Lando betrayed Han Solo and ultimately handed him over to the Empire after Vader threatened to shut down his entire mining operation on Cloud City. In Return of the Jedi, Lando went incognito as a bounty hunter. While under disguise at Jabba’s Palace to save Han, he donned a pretty spectacular suit of armor, complete with tribal looking tusks. According to Star Wars Insider, costume designer Nilo Rodis-Jamero found inspiration in unusual ways. Joking around with his colleague, he placed a baseball glove on top of engineer Wade Childress' head and snapped a quick Polaroid. Rodis-Jamero suddenly wanted to tie it together with Lando's undercover look, and the helmet shown in the film was actually inspired by a baseball glove. Atoning for past sins wasn't Lando's only contribution to the Rebel cause, of course. In Return of the Jedi, Lando was at the helm of the Millennium Falcon as they went to destroy the second Death Star. His co-pilot was a Sullustan known as Nien Nunb, who also joined the ranks as a playable hero character in the video game Star Wars Battlefront. After Return of the Jedi, Lando was mentioned briefly in the novel Bloodline by Claudia Gray. Lando sends Leia a message of support after others discover that Darth Vader was her father. In 10 Secret 'Star Wars' Facts You Never Knew, we shared some lesser known facts about the saga, including how an earlier concept idea for Lando was to have him be a clone. In the original script by Leigh Brackett, Lando is actually called Lando Kadar. In the draft, Han last saw his pal at a trader's outpost on Hoth, and learns that Lando has now created a big Orbital City in the skies. The major departure from the Empire Strikes Back is that the draft version depicts Lando as a clone of his grandfather. In one scene, Lando reveals a sense of loneliness, saying, "It didn't seem strange to us to see our own faces endlessly repeated in the streets of our cities. It gave us a sense of oneness, of belonging. Now, when every face is new and different, I feel truly alone." Other parts of the script did make the final cut of course, namely Lando's betrayal of Han. Mr. Calrissian has certainly made a big impact over time. His character has often been referenced in pop culture, occurring repeatedly in various comedy skits. In Netflix’s recent hit, Stranger Things, Dustin amusingly utters his name when he’s suspicious about a possible betrayal. Key & Peele featured a pretty fun skit called, "Lando's Fan", where a guy named Zeef, ideally, y’know, would like to fly the Millennium Falcon. Robot Chicken on Adult Swim poked fun at Lando's infamous line, "This deal's getting worse all the time..." by inventively adding a pink dress and a unicycle to the list of demands from Darth Vader. Chasing Amy lashed out against Lando with a biting satire at one point, while Mad TV pushed a skit of Lando Calrissian's Amazing World of Exotic Massage back in 1997. Billy Dee Williams even had his life threatened over his infamous role. At Star Wars Celebration 2015, Williams said with a laugh that when he go to drop off his daughter at school, he was barraged by angry ten year olds for betraying Han Solo. Lando has popped up in numerous video games over the years, including Star Wars Battlefront, the mobile game Star Wars Galaxy of Heroes, and Jedi Knight II: Jedi Outcast. Billy Dee Williams reprised his role for all of the video games which feature his voice. This past July, Star Wars Battlefront released Bespin, the second DLC in a total of four. Three have been released, encompassing the Outer Rim, Bespin, and the Death Star, while the upcoming fourth DLC for Scarif is slated for December 2016 release with Rogue One. In the Bespin DLC, you can play on a series of large maps, including the luxe white halls of the Administrator's Palace to the gritty industrial corridors from the Carbonite-Freezing Chambers. They also introduced a new and popular game mode called Sabotage. In order to escape Cloud City, Rebels must work together to blow up the Tibanna Gas Generators which power the Empire's tractor beams. Players can also fly a Cloud Car, and even play as Lando, who was added to the game as a playable hero. He may detest blasters, but in the game, he touts an X-8 Sniper pistol, which offers the player heat sensitive night vision. Bossk was recently added to the game as a playable villain character, and he uses a modified version of the Relby with a similar heat sensitivity mode. EA has confirmed Star Wars Battlefront 2 for a pending release date, so there’s always a chance that we’ll see more of Lando in future video games in the works. Although not considered canon, in Legends, Lando had a political marriage with Tendra Risant. A known businesswoman, Risant was originally from her home planet of Sacorria, and with Lando, the pair founded the corporation called Tendrando Arms. One of their successful products was the YVH 1 or the Yuuzhan Vong Hunter One combat droid, which gives off some serious Terminator vibes. They later had a child, Lando Calrissian, Jr., affectionately nicknamed “Chance”. In the Marvel comics, we’re shown bits and pieces of his colorful love life. At the beginning of Lando #1, he charms the Imperial Moff Ssaria into allowing a rare artifact to clear some of his old debt. The comic kicks off with an intimate bedroom scene featuring a smooth talking Lando alongside Ssaria. While the scene is open to interpretation, Lando directly says that he’s her lover and claims to want the item as a means to help their relationship. There’s no further mention of what happened between them in the past, like a flashback, nor is there any mention of her later in the series. Last year, the anticipation to The Force Awakens was literally through the roof, with increasingly outrageous fan theories circulating the web. When new merchandise hit the shelves, it caused an even greater commotion online. An Amazon retailer listed a puzzle of Finn as “THE SON OF LANDO CALRISSIAN” and it pretty much caused an uproar. Sure, it might be outright laughable, and there’s literally tons of reasons why this would be an extremely shallow cop-out when it comes to the new trilogy's plot… but there’s one other reason that keeps this theory somewhat relevant. 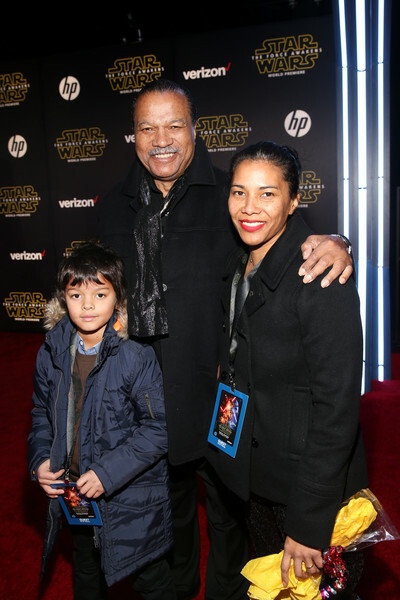 When Billy Dee Williams hit the red carpet last year at The Force Awakens premiere in Los Angeles, he smiled politely to interviewers and introduced his young grandson to the camera. His name? Finnegan. So, that does bring up the question … is Finn really Lando’s son, or perhaps an estranged family member? Is his name an easter egg reference to pay homage to Billy Dee Williams' work? Or are we just grasping at air, valiantly hoping for some kind of connection, even if there’s literally nothing? Even if it’s probably the latter, it’s still pretty fun to partake in these Star Wars related mysteries. In an interview with Vanity Fair last year, writer Lawrence Kasdan dropped a huge teaser about the future of Lando Calrissian in the Star Wars big screen universe. Although he confirmed that Calrissian wouldn’t appear in The Force Awakens, he didn’t exactly leave it at that. “But Lando I don’t think is finished in any way, shape, or form,” he elaborated. We have to admit, there’s certainly tons of opportunities for Rey, Finn or Poe to cross paths with the infamous smuggler in the future films to come. We’ve already been introduced to Maz Kanata, who had a series of flags representing space pirates like Hondo Ohnaka and bounty hunter Boba Fett. It wouldn’t come as a huge surprise to find out that Maz has also met Lando as well. When asked if he would return to the Star Wars universe, Billy Dee Williams said that he’s game, so it looks like we’ll have to play the waiting game for now. Critics have bashed Lando for being too stereotypical and a shallow type of sidekick. In the New York Times review for The Empire Strikes Back, Janet Maslin called Lando’s character “exaggeratedly unctuous, untrustworthy and loaded with jive”. However, she changed her opinion when she reviewed the 1997 re-release of the film, calling William’s performance “smashing”. In an 1980 interview, Billy Dee Williams touched on the limited amount of racial diversity in written roles in the industry. And in an BFI interview from 2014, Williams added that he tried to make Lando a hero that transcends the old cliché, not wanting to focus on Lando’s ethnicity, but rather a person living in the future, beyond those types of questions. Do you know of any other fun facts about Lando? Let us know in the comments. Rogue One: A Star Wars Story opens in U.S. theaters on December 16, 2016, followed by Star Wars: Episode VIII on December 15, 2017, the Han Solo Star Wars Anthology film on May 25, 2018, Star Wars: Episode IX in 2019, and a third Star Wars Anthology film in 2020.